There are many things that Alaska is known for, our ocean and its sea life, our mountains and their wildlife, our rivers, our wide open spaces, gold, fur, and oil, however sled dogs captivate the imagination of the world like no other Alaskan feature. Come share in our lifestyle, of love of sled dogs, and the beauty of Alaska. Learn what it is like to live with the world’s greatest athletes as you visit with our puppies, witness sled dogs in action, and virtually experience running the Iditarod. Enjoy stories of the adventures of living an ever-growing dream both on and off the trail. Discover what it takes to make it on the Last Frontier and experience the journey that is Iditarod. DogGoneIt stands out as one of the most memorable experiences of an Alaskan vacation. Not only do you have the chance to learn about the Iditarod and meet the dogs and puppies, but the intimate visit to our Alaskan home gives you the chance to learn about the real experience of living in Alaska and make personal connections with our family. This authentic atmosphere combined with a professional tour experience have made DogGoneIt winner of numerous awards. DogGoneIt provides a bright spot in a visit to Denali, regardless of the weather. You will have the opportunity to meet the dogs, hold the puppies, and virtually experience the Iditarod race. Your intimate visit will bring you to our home and includes an hour and a half narrated tour in which you will learn about sled dogs, the Iditarod sled dog race, and life in rural Alaska. The tour emphasizes multimedia through which you can experience a virtual sled dog ride and the feeling of being on the Iditarod trail. Your visit begins as you spend time with our puppies. 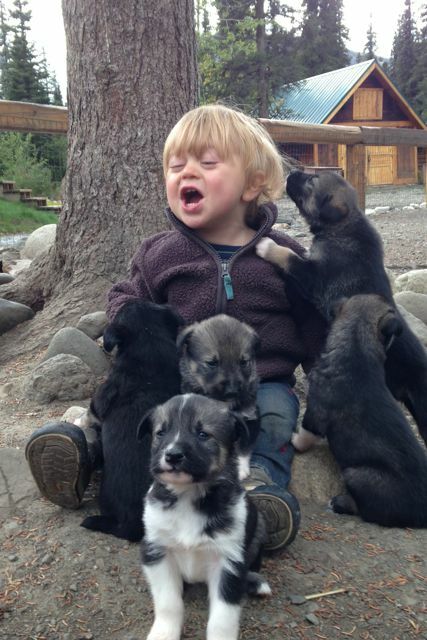 Get a chance to hold a young sled dog puppy and see their puppy play area. After you have had a chance for a snuggle and a photo, the more formal part of your visit begins. Watch as a team of enthusiastic sled dogs take off for a summer training run. Learn about the breed as you watch a slideshow of photos and video and meet individual members of the team. Next you will move indoors for a multi-media presentation allowing you to understand and experience the Iditarod Sled Dog Race and what motivates Mike Santos to participate. See video footage, photos, and equipment from the race and be entertained by stories of the successes and challenges we have encountered in our journey. Experience winter on the trail through our video, sound, and light show. Your visit concludes with a chance to ask questions, see more dog mushing equipment and souvenirs, and get one last view of the dogs and puppies.